Dickinson’s incandescent thinking is everywhere on display, and the makeshift nature of the scraps gives us a vivid idea of what composition must have felt like for a woman whose thoughts raced far ahead of her ability to capture them. Although a very prolific poet, Emily Dickinson (1830–1886) published fewer than a dozen poems. Instead, she created small handmade books. In her later years, she stopped producing these, but she continued to write a great deal, and at her death she left behind many poems, drafts, and letters. It is among the makeshift and fragile manuscripts of Dickinson’s later writings that we find the envelope poems gathered here. These manuscripts on envelopes (recycled by the poet with marked New England thrift) were written with the full powers of her late, most radical period. Intensely alive, these envelope poems are charged with a special poignancy—addressed to no one and everyone at once. Full-color facsimiles are accompanied by Marta L. Werner and Jen Bervin’s pioneering transcriptions of Dickinson’s handwriting. Their transcriptions allow us to read the texts, while the facsimiles let us see exactly what Dickinson wrote (the variant words, crossings-out, dashes, directional fields, spaces, columns, and overlapping planes). Here is a book almost as rare as its author, Emily Dickinson (1830–1886). The Gorgeous Nothings is proof that one of our most important poets can still amaze and teach us new thing about the practice of poetry. [The Gorgeous Nothings] opens up an aspect of her craft that suggests she was, in the so-called late ecstatic period of her career, experimenting with creating texts in relation to the visual, spatial, and technological possibilities of her medium—composing in response to the confines of her writing world rather than despite it. An insightful new volume, The Gorgeous Nothings, edited by Jen Bervin and Marta Werner, also provides a fascinating glimpse of Dickinson by assembling images documenting the poetry she scrawled on repurposed envelopes — envelopes that have themselves been elevated to a new sort of art. The Gorgeous Nothings is one of the most ambitious, important literary feats of the year. It’s stunning, revelatory, and it functions as a key text to Dickinson’s oeuvre: seeing it demands a tectonic shift in the way we read her, brings her back to us even more extremely idiosyncratic than we could have guessed. For years, Dickinson critics have been looking for some kind of order among the manuscripts - some way to describe or theorize the ‘filing system’ that the poet left and we found. In The Gorgeous Nothings, instead, what’s restored to these traces of the work is a sense of occasioned disorder. What’s been preserved through time in her handwriting is the decision to occupy the page. The page becomes just as important as the writing. The beautiful reproduction, on the pages of The Gorgeous Nothings, of what might seem only negligible scraps of waste paper brings us closer to the restlessness of the constantly thinking poet who, in her later years, repeatedly seized her pencil and a fragment of an envelope to write about the lowliest and the most exalted states of being. Visual poets around the world will soon be mining these endlessly suggestive fragments. The shocks are in the words, with other, lingering, aftershocks following in the visual details of their settings. The great thing about this indispensable book is…that it gives us all of this, complete. [The Gorgeous Nothings] is a rare gift for all poetry lovers. 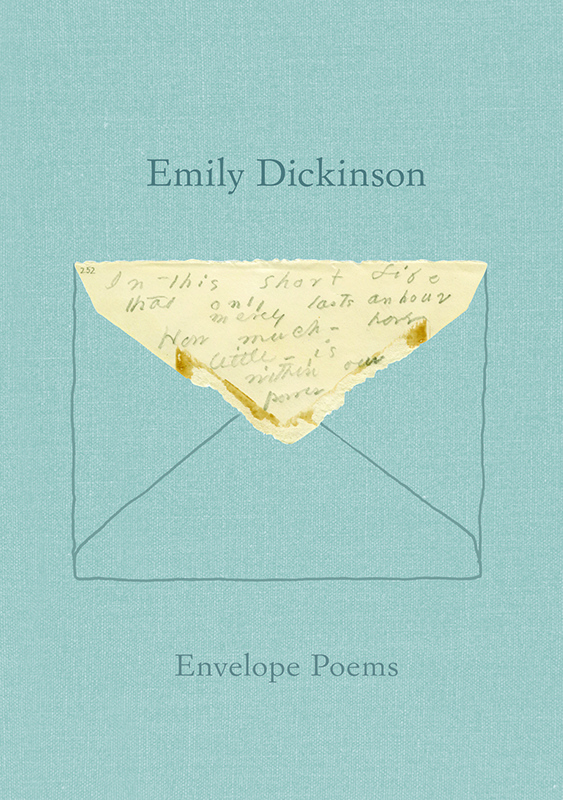 This exquisitely produced book [The Gorgeous Nothings]—lovingly curated by Bervin and Werner—allows you to encounter Emily Dickinson’s ‘envelope poems’ in full-color facsimile for the first time. It’s an experience suspended between reading and looking, of toggling between those two modes of perception, and it thoroughly refreshes both. Magnificent: the absolute perfect combination of solid scholarship and art.